Above: Executive Chef Frederic Camonin. 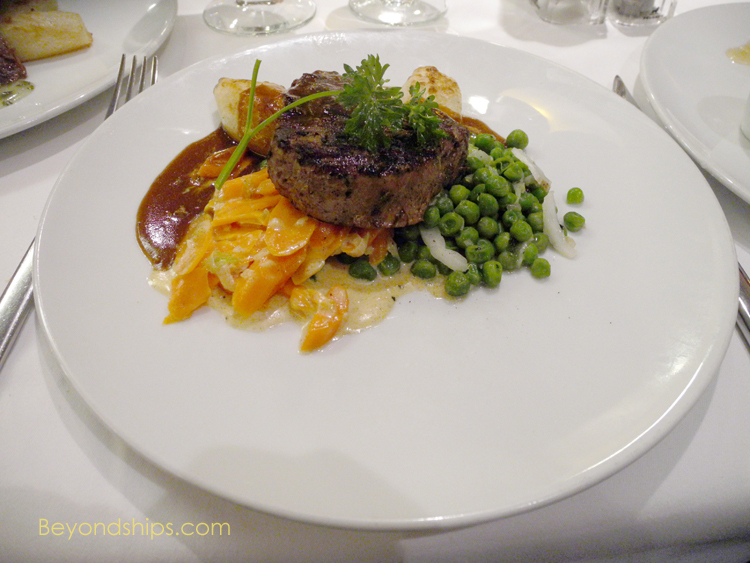 As it was in the days of the Titanic, dining is an important aspect of an ocean voyage. For the Titanic Anniversary Cruise, Journey's culinary team went beyond the ship's usual menu to recreate some of the dishes that were served on Titanic. This involved research into what was served on the Titanic and for this Executive Chef Frederic Camonin turned to two books - - "Last Dinner on the Titanic: Menus and Recipes from the Great Liner" by Rick Archbold and "RMS Titanic, Dinner is Served" by Yvonne Hume. These volumes "were of great assistance as we attempt[ed] to recreate as closely as possible, the final meal enjoyed by those tragically lost in the disaster." "One of our greatest initial concerns was the availability of the start of any recipe - - the ingredients. Would we be able to find the same ingredients today as were common in 1912? The essential elements of cuisine have not changed a great deal in the last century, but certainly there would have been spices, delicacies, or even produce that may have been popular in that day that we would simply no longer be able to find. Fortunately, the changes in tastes and trends were not as great as we initially feared, and we have, we feel, been able to offer dishes that would have been very similar to those originally offered aboard RMS Titanic." In addition, much has changed with regard to how meals are prepared over the last century and so the chef had to analyze how these dishes could be prepared using the modern cooking equipment with which Azamara Journey's galley is equipped. The results of this work were presented to the guests in two ways. First, each evening, there was a different Titanic-inspired dish available in addition to the items listed on the dinner menu in the main dining room. Second, on the first formal night, there was a gala Titanic dinner at which the entire menu was based upon items that were served on the Titanic. Upper class Edwardians liked to devote the bulk of an evening to dining and in that sprit, the gala dinner included eight courses beginning with Oysters Findlay and followed by soup, fish, main course, sorbet, salad, dessert and cheese. Guests only had to make a decision with regard to which soup, which main course and which dessert to have; all of the rest appeared at the table automatically. Not just the main dining room but also the ship's two specialty restaurants were pressed into service for the gala dinner. This was done because it was expected that the dinner would last at least three hours and thus, the main dining room could not be expected to turn over as on a normal night. Each item presented during the dinner was nicely prepared and presented. However, those who had fantasized that the food on Titanic was ambrosia were to be disappointed. The dishes were not significantly different in taste than Journey's usual fare. Indeed, the second formal night featured a multi-course chef's selection menu that was not qualitatively different than the first gala dinner. Above: Lamb with mint sauce. For the formal evenings, including the gala dinner, guests had the option of dressing in Titanic period costume. A few guests had brought an entire wardrobe of period costumes and began to wear them even before Azamara Journey left the pier in New York. However, most of the guests who brought costumes did not wear them until the first formal night. Some of the guests who brought costumes had researched the fashions of 1912 and their costumes were authentic to those times. Others had not been so zealous and had opted for an outfit that generally recalled the early 20th Century. Far more women than men elected to dress in costume. The passengers who dressed in costume looked elegant and attractive. They clearly enjoyed being a focus of attention and posed for numerous photos. For some, wearing period costume was a chance to live their fantasy. Not everyone, however, felt that the costumes were appropriate. Although the events that were theme of the cruise took place a century ago and although the story has been fictionalized by Hollywood, the sinking of the Titanic involved the deaths of over a thousand real people. Some passengers felt that wearing a period costume was disrespectful just as it would be inappropriate for someone who is not a policeman or fireman to wear a police or fire uniform to the site of the September 11, 2001 attack in New York City. A counterargument is that the period costumes were a tribute to those who were on Titanic. Period costumes of colonial soldiers have long been worn in American Independence Day parades as a tribute to the founding fathers. Similarly, guides and re-enactors wear period costumes at battlefields and historic sites to bring the past to life thus give visitors a better feel for the relevant historic period. As Bill Miller observed, the costumes on the cruise not only allowed the people who wore the them to more closely experience what it was like on Titanic but the observers as well, "I think it was a wonderful add-on It just brings you even closer to the event."